I’m so glad Randy encouraged our staff to watch the livestream. If you’ve ever thought “I wish they would stop playing the race card” or “I’m glad racial discrimination is behind us” or “It wasn’t me personally who participated in the past so quit blaming us” then I urge you to watch these videos. You might not always like what’s being said or agree 100%, but go with an open mind and listen, listen, listen to these godly men and women who love Jesus and seek to live for Him. I had a lot of questions in my mind and most of them were answered through the panel discussions. I wish this conference could be repeated all over the U.S. as, I for one, would be there! I wholeheartedly agree. You can watch the videos on the TGC site. I really appreciated Russell Moore’s opening address, “Black and White and Red All Over: Why Racial Justice Is a Gospel Issue.” Mika Edmonson’s message titled “The Power of Unearned Suffering: Celebrating MLK’s Legacy after 50 Years,” was powerful, as was Matt Chandler’s session on “A House Divided Cannot Stand: Understanding and Overcoming the Inconsistencies in White Evangelicals on Racial Issues.” Other speakers included Benjamin Watson, Ralph West, John Piper, Jackie Hill Perry, and Eric Mason. And don’t miss the session with one of my heroes, John Perkins, who talked about “The Civil Rights Movement 50 Years after MLK.” Years ago John was tortured and humiliated in a Mississippi jailhouse for the crime of being black, but rose above the hatred to become the Voice of Calvary. Except for the grace of Jesus, there is no explanation for such a life. I first met John when we spoke at a conference together in Minnesota in 1987. Eight years later I went to Jackson, Mississippi to spend time with John when researching my novel Dominion, and modeled parts of my character Obadiah Abernathy after him. 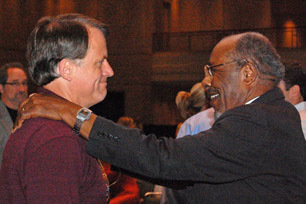 In 2008, the Evangelical Christian Publishers Association honored John Perkins with the Lifetime Achievement Award. After John spoke, I waited at a distance. Though ten years had passed since we’d last seen each other, his face lit up when he saw me, and he called me by name. A photographer snapped a picture of John greeting me, his hand on my shoulder, which appeared on the front page of a newspaper the next day. I still treasure that photo. More recently John asked me to write the foreword to his autobiography, Dream With Me, which I was honored to do. Perkins grew up in a sharecropping family on a Southern plantation, with an absentee father and a mother who died of malnutrition when he was seven months old. He remembers the sting of a white boy’s BB gun (and the frustration of knowing he couldn’t fight back), going around to the main house’s back door, and watching old black men step off the sidewalk to let white women pass by. Things didn’t get better. Perkins spent most of his adult life working in under-resourced black communities, held down by white segregation and oppression. His older brother, freshly back from serving in World War II, was killed by a white police officer. And Perkins himself was jailed and tortured by racist white police in 1970. But while Perkins spent the next 50 years fighting back—he led demonstrations and filed lawsuits on behalf of blacks on issues of equal pay, hiring practices, poor treatment of inmates, and voting rights—he also championed forgiveness and reconciliation. That makes his message a powerful one for both white and black church leaders. Racial unity is a topic that I’m glad to see more churches in our country addressing. Still, there’s much work to be done. I agree everyone needs Jesus and that makes all the difference. Yet many whites and blacks who do love Jesus with all their hearts feel alienated from each other when they hear one another talk about race.